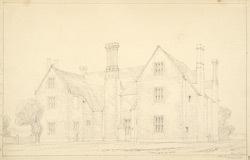 This pencil drawing depicts the exterior of Plaish Hall in Shropshire. Plaish is an early brick-built house, erected in the mid 16th century by Sir William Leighton. Although the building is topped with modest gabling, the elegant brick chimneys display zigzag, diaper and diamond patterns. The interior boasts fine Elizabethan panelling and plasterwork.